A 1:6 COLLECTOR-QUALITY REPLICA OF THE FAMOUS1959 TRIUMPH BONNEVILLE "TANGERINE DREAM"
A well known maker of 1:43 and 1:18 cars has recently created a new brand that will specialise in the modelling of famous classic bikes in the extra large 1:6 scale; most model bikes, such as those made by Minichamps and Schuco are in the much smaller 1:12 scale. 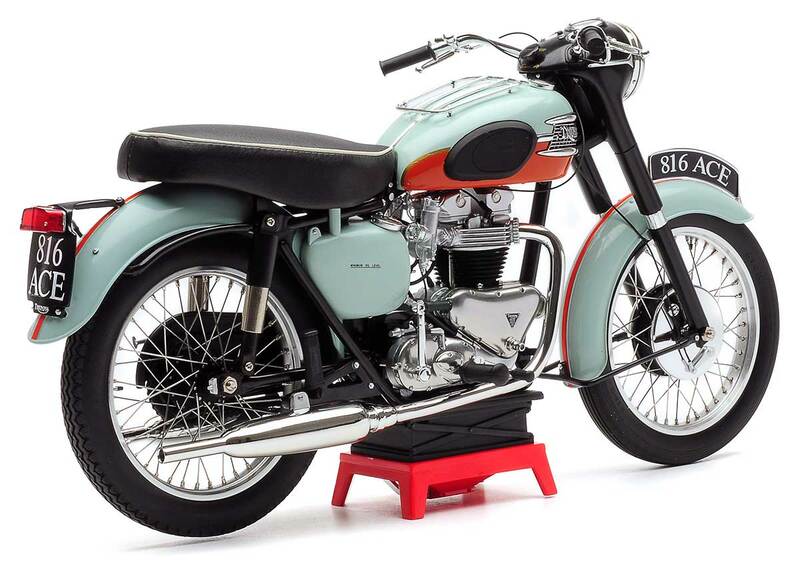 The first subject to be produced by Vintage Motor Brands is what is, in many people’s eyes, the most significant Triumph of all: the 1959 Triumph Bonneville; in this case the early Tangerine Dream version. The Triumph Bonneville can rightly lay claim to being perhaps the most famous motorcycle of all time. It took its name from Johnny Allen’s successful Triumph engined attempt to take the world speed record for two wheeled machines at the Bonneville Salt Flats in 1956. The new bike was officially announced in 1958, but didn’t go into production until the following year. It was created largely in response to the US market’s demand for a more powerful bike. The new Bonneville was based on the company’s Triumph Tiger T100, and was fitted with the Tiger’s optional Twin Amal monobloc carburettors, and the same bike’s high-performance inlet camshaft. Thus configured, the bike’s 650cc parallel twin motor was able to take the bike to an honest 115 mph top speed; not bad for 1959. In fact, the first Bonneville didn’t go down particularly well in the US. They didn’t like the colour. Whilst the headlight nacelle and sturdy mud-guards gave the bike a heavy, somewhat old-fashioned look. What American buyers really wanted was a more powerful version of the sportier TR6, which eventually is what the Bonneville became. But even though the Tangerine Dream was not the instant success Triumph had hoped for, it set the tone for a hugely popular biking dynasty that is still alive and kicking today. 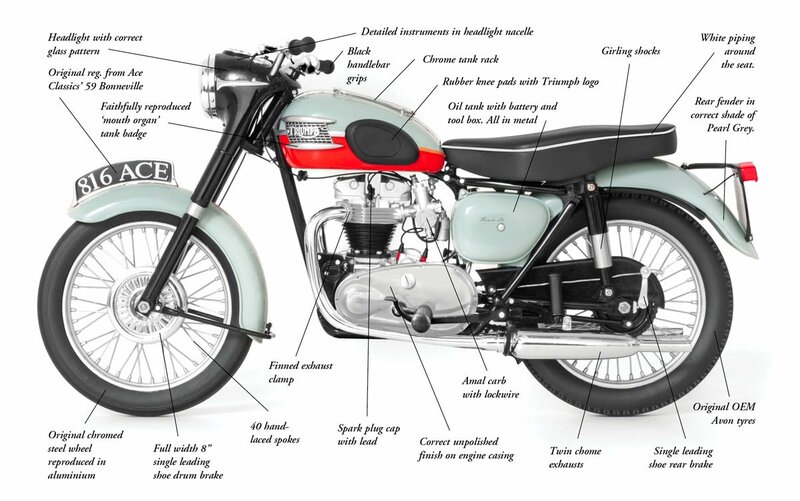 It was the bike that, more than any other, made Triumph a household name; a bike that was loved by celebrities and racers as much as it was by the commuting factory worker, and the youngsters who, over here, turned them into café racers. This new model, which is now on our shelves, is the culmination of a project that started to take shape more than three years ago. We here at Diecast Legends were always the largest seller in the world of Minichamps’ 1:12 bikes, and so VMB approached us about becoming involved. And, of course, we were delighted at the prospect. 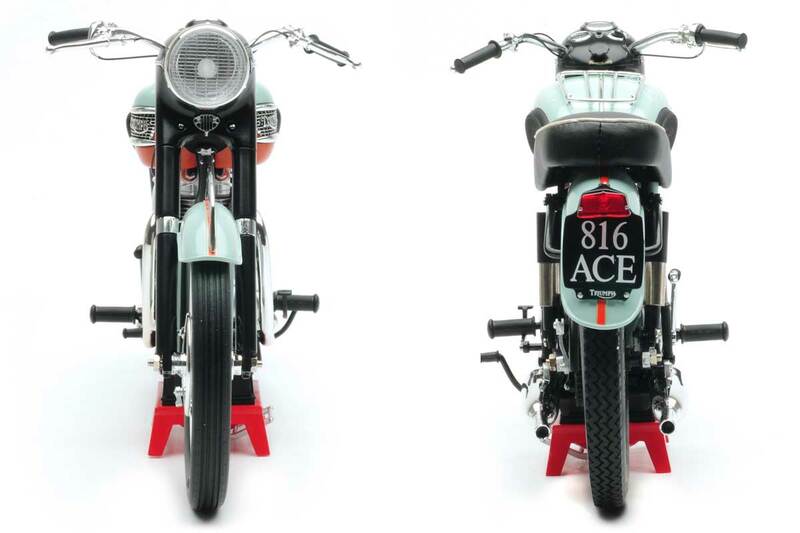 The first bike we wanted the company to create was, of course, the ’59 Bonneville. It was, we felt, a particularly famous bike, and one that had never been replicated to what one might call a collector standard in any scale before. And so we contacted Ace Classics in South London, on behalf of Vintage Motor Brands, to source an immaculate example of an original ‘59 bike. Luckily, they had a totally correct, unrestored machine that they were able to give VMB unfettled access to. They measured everything. Twice! And took hundreds of photographs, capturing every component from every conceivable angle. VMB call it a resin replica, but it has a good weight to it, and has a number of metal parts, such as the oil tank and wheels. The detail is particularly impressive, and we have no hesitation in suggesting that this new Bonneville is every bit as impressive from a model engineering perspective as any 1:12 or 1:6 replica bike we’ve ever been involved with before. We’re talking about things like the correct OEM Avon tyres, the right pattern on the headlight glass, and wonderfully delicate, hand-laced aluminium, spoked wheels. Even the carbs. are Amal branded, even though the wording is almost too small to be read by the human eye. The paint on a classic bike model bike is never without controversy, because everybody has a perception about what shade is correct, and what shade is not. The problem is that any bike with original paint is now nearly sixty years old. And paint fades. But we went to the UK’s top specialist in classic Triumph paint. He created swatches for us; and the model’s paint is incredibly faithful to those original colour swatches. We could not be more pleased with the way this replica has turned out. It’s going to be a classic in every sense. You will never forgive yourself if you miss out. The model is big. It’s twice as long, twice as high and twice as wide as a 1:12 replica, which means it’s actually eight times the volumetric size of a 1:12 bike. Measuring some 13” in length, it looks amazing, whether it’s displayed on a shelf, or in a cabinet, or as part of a collection. Now the first ever model produced by any new maker is always going to be highly collectible, and the Tangerine Dream model is VMB’s first. In the coming months and years, there are plans for an MV Augusta 750S, a Vincent Black Shadow and a Norton Manx. Even more excitingly, VMB recently came back from California where they photographed and measured Rollie Free’s actual Black Lightning, which exists today completely as it was at Bonneville in 1948. This is going to be a very special presentation and, of course, it will come with a prone Rollie figure. All of VMB’s bikes will be limited to no more than 999 pieces worldwide. The first manufacturing run of the Bonneville is just 500 pieces. There may, if demand dictates it, be a second production at some point in the future. In the UK, the model is available exclusively from us here at Diecast Legends. What we’re suggesting is that, if you want to be sure of getting one of these bikes, you should place an order now, or at least very soon. And if you’re not delighted with your bike when you receive it, your purchase price will be refunded in full. Which brings us finally to the price. 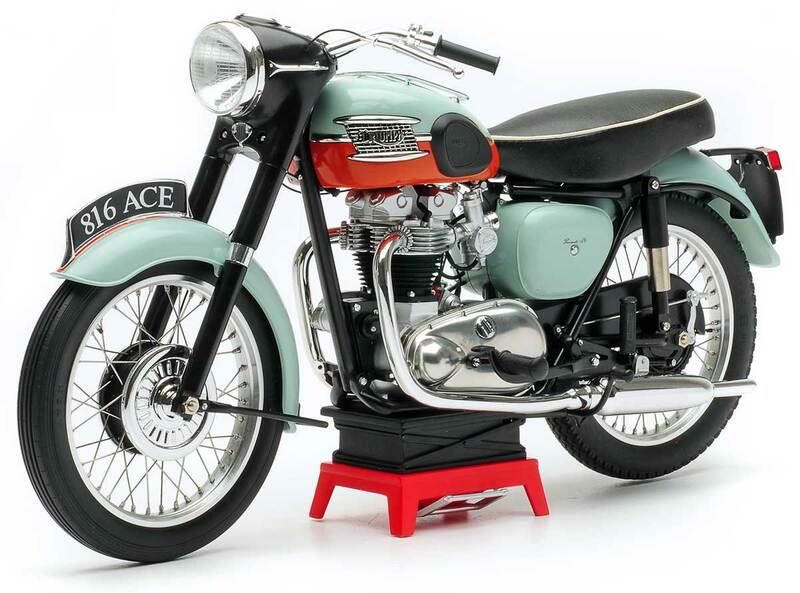 The Bonneville sells for £299.99 (VMB001). Minichamps’ most recent 1:12 classic bike was priced at £179.99, which makes this 1:6 replica a bit of a bargain in our eyes, especially given the extortionate price 1:6 Minichamps bikes now go for on eBay these days. The bike will never be available from any other UK retailer. This replica will also not be sold at a discount on eBay or Amazon, so its future value will be guaranteed. In fact, given the prices being asked for existing Minichamps 1:6 classic bikes, we can only see prices going one way. We reckon you should act now. It would be a shame to miss out on what is undoubtedly one of the most exciting replica bike releases of all time. 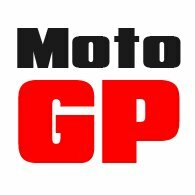 We hope to hear from you, either via the website: www.motolegends.com/tangerinedream, or on the phones at 0844 887 8888. Our lines are open six days a week. But don't think about it for too long. We think that the initial production could easily be sold out very soon. Just don’t say we didn’t warn you! Want some more editorial stories? Please click here to return to the Motolegends home page.